The HoneyBook Contact Form is a widget that can be installed on your company website, allowing you to pose a series of questions to potential clients and collect the information in your HoneyBook account. Incoming requests will automatically populate as Inquiries in your Project Pipeline, to ensure no lead is left behind! 2. Select Contact Form from the menu. 3. 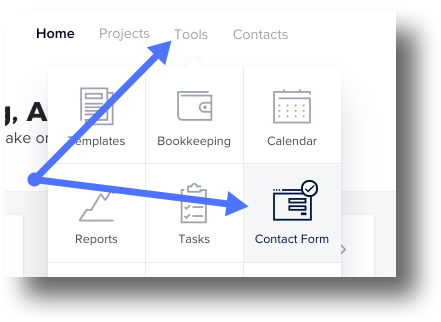 You can work off of the default form we provide, or create your own by clicking the tab on the left side of the screen to open your File Drawer, then selecting Add Contact Form. 4. Edit or remove the pre-populated questions by clicking on a question itself, selecting the text to edit, or clicking the trash can icon to delete. PLEASE NOTE: Email Address and Full Name fields can be edited, but not deleted. Some questions will note that they are connected to specific fields; when these are filled out by your leads, the answers will automatically populate into the Project Details fields of the Inquiry that gets created. 5. Add new questions by clicking a question type in the Custom Fields menu, entering your question text, and providing answer options if applicable. You can add up to 20 questions. HoneyBook Tip: Click the 6-dot icon on a question to drag and drop, reordering your questions. 7. Click Preview to review how your Contact Form will appear. 9. Now, you can embed the code right into your website. Here's how to do that for a variety of sites. 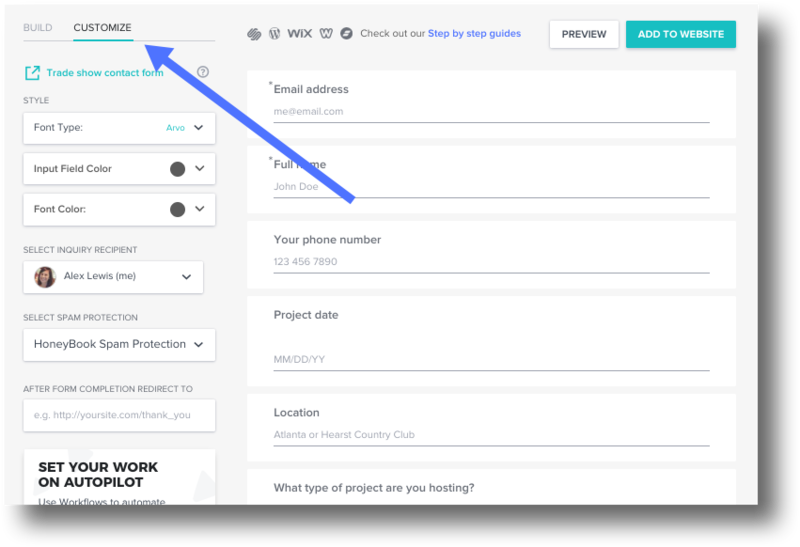 Now that you've added the Contact Form to your website, check out Workflows to automate some processes even further! How many Contact Forms can I use? Can I use Contact Forms on different websites with different URLs?